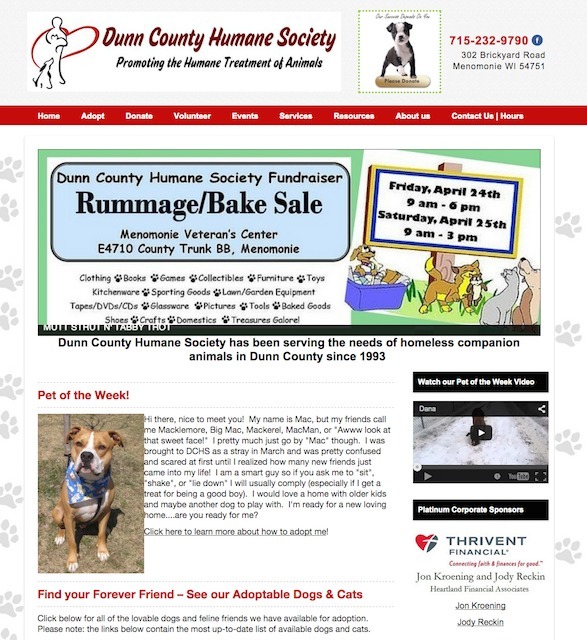 Dunn County Humane Society wanted to re-do their google site on WordPress so it had a fresh look, the ability to add events and photos easily, and most importantly, a simple way to feature their animals for adoption. Using a customized child theme based on SmallBiz Dynamic by Expand2Web Experts, we were able to provide a robust but simple platform on which the DCHS members can promote adoption, fundraising, and volunteer participation. This theme is known for its inherent Search Engine Optimization (SEO) capabilities. We will continue to work with DCHS to extend their SEO reach and hopefully broaden their supporter base. It was a pleasure to do this project – super nice people who do an amazing job for the animals in Dunn County.